Basically, this much is pretty obvious now: LIGHT and food in the morning + darkness after sunset = proper circadian entrainment. But the how is pretty cool; LIGHT affects different biochemical pathways at different times of the day, which is how it can either advance or delay your circadian phase. LIGHT entering the eyes is perceived by ipRGCs which then dish out glutamate and PACAP. These mediators go on to activate receptors in the SCN (the “Master Clock”). 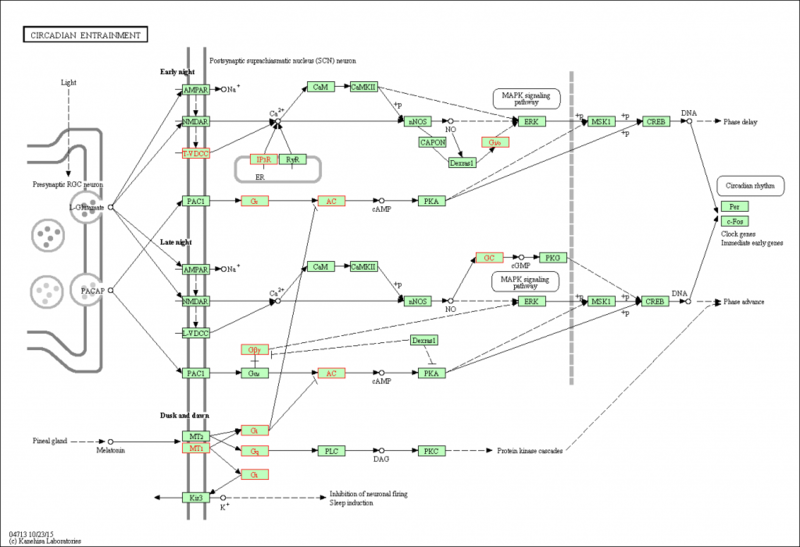 Depending on the time of day, glutamate and PACAP affect different pathways. Fortunately, I found a few articles breaking down the individual components. 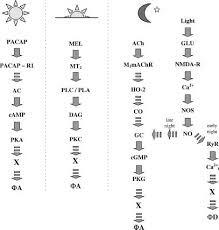 LIGHT at pre-sunrise (“late night”), during the dark-to-light transition AKA sunrise, and even in the early afternoon: the most important mediator is PACAP, which activates PAC1 receptors and cAMP -> PKA -> transcription of circadian genes and voila, phase advance. Interestingly, activating this pathway downstream of PACAP at night doesn’t work, and it’s thought that PACAP is responsible for “sensitizing” the PKA pathway specifically for daytime activation (eg, Michel et al., 2006). Glutamate hits SCN NMDA receptors which, via calcium signalling, makes nitric oxide -> guanylate cyclase -> PKG -> transcription of circadian genes and voila, phase advance. 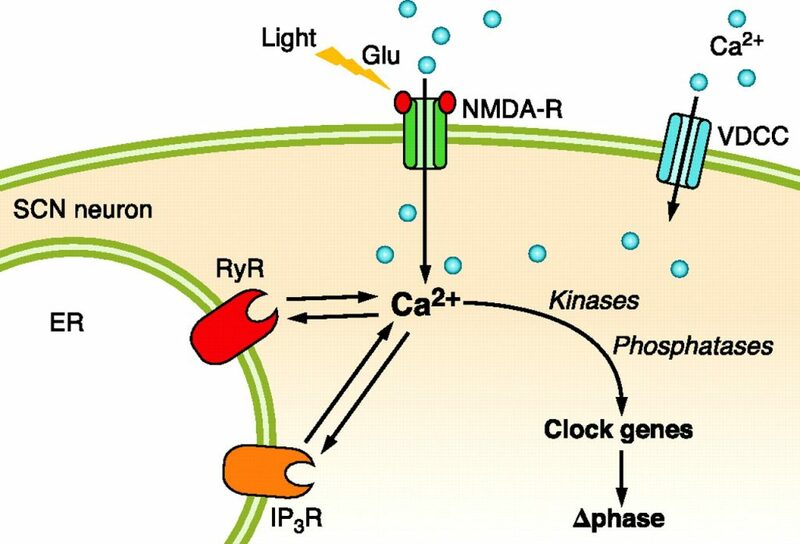 Interestingly, in the early evening or at sunset, light-induced glutamate-nitric oxide targets ryanodine receptors (as opposed to guanylate cyclase) which release calcium and activates ERK signaling -> transcription of circadian genes and voila, phase DELAY! 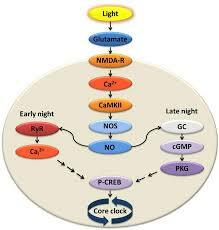 Nitric oxide at night: PKG & phase advance. Nitric oxide in the morning: ERK & phase delay. PACAP at night: PKA & phase delay. And it seems you can’t do this by activating PKA downstream of PACAP — light-induced PACAP is essential for this. How does melatonin come into play? One way is via directly activating SCN melatonin receptors -> induce potassium influx -> inhibition of neuronal firing -> sleep induction. Interestingly, potentially an overlapping role for vasopressin and other blood pressure modulatory hormones here. The exact reasons aren’t known why light-induced nitric oxide does ryanodine, ERK, & phase delay in the early evening vs. guanylate cyclase, PKG, and phase advance in the early morning. But it’s still pretty cool, imo. Daytime: SCN reduced (eg, NADPH, reduced glutathione, melatonin “sensitizes” the system), increased neuronal activity, SCN fuel use doubled. Night: SCN oxidized (eg, NADP+, oxidized glutathione), reduced SCN neuronal activity. Keep an eye out for PACAP and REV-ERB alpha in the future of research into circadian biology; I think they’re important. This entry was posted in Advanced nutrition, angiotensin, Bromocriptine, Cabergoline, chronopharmacology, circadian, Dopamine, Ketosis, Leptin, melatonin, nicotine, Sun, vasopressin, Vitamin D and tagged circadian rhythm, melatonin. Bookmark the permalink.